There are innumerable questionnaires for tinnitus, and the THI is a popular one. The THI is also called the "THQ" for tinnitus handicap questionnaire. Overview of the THI test. 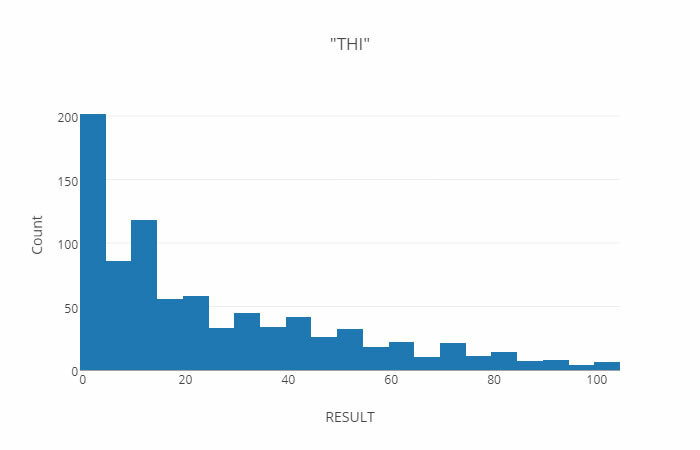 The THI is not a diagnostic test -- rather it produces scores related to the percieved tinnitus handicap -- a subjective quantity. The THI is a 25 item test, and the maximum score is 100. Salviati et al (2013) reported that scores above 36 suggest psychiatric distress. We also have a large repertoire of dizzy patients in our clinic practice with tinnitus, where we have obtained the THI. For these, the distribution is much different than for the DHI . This data is from the beginning of 2018(n=854). These are mainly people who are dizzy, and whose chief complaint is not tinnitus at all. There may be a few who are mainly being seen for tinnitus however. Newman, C. W., et al. (1996). "Development of the Tinnitus Handicap Inventory." Arch Otolaryngol Head Neck Surg 122(2): 143-148. Newman, C. W., et al. (2008). "Development and psychometric adequacy of the screening version of the tinnitus handicap inventory." Otol Neurotol 29(3): 276-281. Salviati, M., et al. (2013). "The Tinnitus Handicap Inventory as a screening test for psychiatric comorbidity in patients with tinnitus." Psychosomatics 54(3): 248-256.